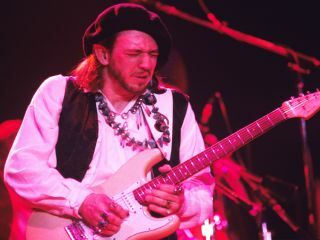 To help mark the 20th anniversary of Stevie Ray Vaughan's death (27 August 1990), Stevie Ray Vaughan And Double Trouble's1984 breakthrough album Couldn't Stand The Weather will be reissued on 26 July as a remastered, deluxe two-CD set, featuring 11 studio outtakes from the original recording, three of them previously unreleased. The second CD in the set premieres a previously unreleased, late-night concert from August 1984 at The Spectrum in Montreal, Canada. Featured are a mix of songs from Couldn't Stand The Weather, plus tunes from the band's 1983 debut, Texas Flood. According to Andy Aledort, associate editor of Guitar World, who wrote the liner notes for the project, "Though a mere six months had passed between the release of Texas Flood and the start of the Couldn't Stand The Weather recording sessions, a great deal changed for the band, professionally and personally, in that short period. "Couldn't Stand the Weather represented the first time the band had a recording budget, but with it came record company pressures that had been absent previously. In addition, as the pace of the band members' careers increased, so did the level of partying and drug use." The bonus track studio outtakes on disc one add a new perspective to the band's chronology at this early stage, starting with Stevie's original, Empty Arms, one of several tracks here from the first posthumous SRV collection, 1991's Grammy-winning The Sky Is Crying. Hank Ballard And The Midnighters' Look At Little Sister and Earl King's Come On showed up in different versions on SRV&DT's 1985 album Soul To Soul. The band had performed Freddie King's Hide Away and Hound Dog Taylor's Give Me Back My Wig at various concerts, but neither song would appear on any of their album's during Stevie Ray's lifetime. Additionally, the previously unreleased versions of Boot Hill and Elmore James' The Sky Is Crying differ from those heard on the 1991 set. Disc one closes with a previously unreleased alternate take of the short instrumental, Stang's Swang, one which dispenses with the saxophone.